Sheep, mutton, hogget and lamb. As I mentioned in Ba ba Black sheep we kept a couple of lambs over the summer to fatten up for the freezer and we intend to do the same again next year, possibly keeping a couple of ewes long term, I thought it would be a good idea to document things in a little more detail. Fencing: We decided on electric as it was cheap and flexible, very important if you intend to move your sheep about. We managed to pick up 500m of wire, 100 insulators and an energizer that can be powered by battery or mains for less than £60. We had wooden posts left over and reclaimed from when we set out our batter boards marking the house foundations and I utilised the orchard trees if they formed the perimeter of our paddocks. I also just happened to have a couple of old spare car batteries that I have kept in cold storage, just waiting for a purpose. Once charged up I alternated the two batteries once a month to keep the system live. 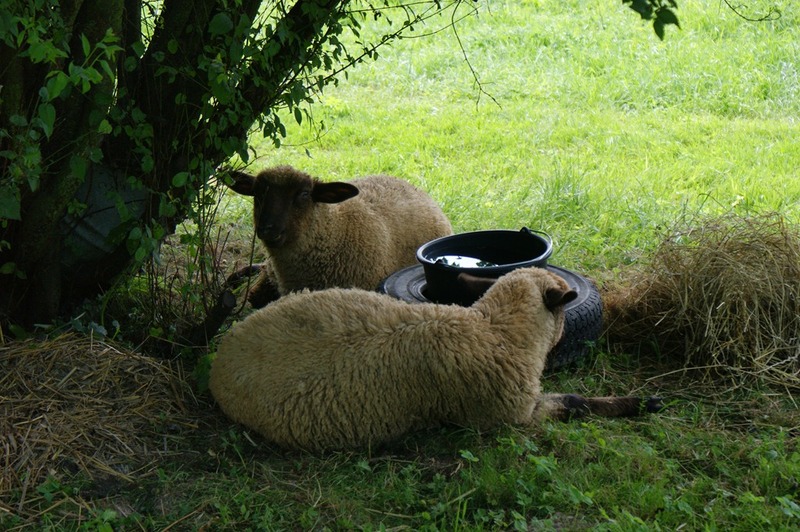 Housing: As a Yorkshire man I had not imagined keeping the sheep indoors, even if that’s what people do in Poland, however it does get hot in the summer so I knocked up a shelter against the side of the old house to provide shade if required. The shelter is about a meter and a half square made from old shuttering planks and some ashfelt left over from the foundation damp course, all very thrifty stuff. Lambs: Apparently you are able to buy lambs on the black market in Poland if you know the right people. We bought two and completed all the paperwork (which I won’t bore you with) They were about 3 months old and weaned. the lambs cost around £120 for the pair, although this cost was shared with our friends Steve and Dorota; the deal being that we would keep them as long as they arranged the slaughter; a deal which worked out well. I initially set out the fence with two wires spaced at 30cm and 45cm from the ground, providing about 150 square meters of grassland around an old wild plumb tree for shade along with the shelter that I had built; this took me about 3 hours to complete. After the short journey from their previous home, quite stressful for all I think, we reversed the van to the paddock, let them find their way out and closed the fence behind them; easy! I did stay and observe them for some time to check on their general well being and to make sure that the fence did the trick. I have read in several books that electric fencing is not the best solution for sheep as the wool can insulate them, the one thing that isn’t often mentioned though is that sheep are quite intelligent and once they have had there first shock (about 30 minutes after they arrived) they stayed away from the fence; or at least for the first month or so 🙂 I did become a little worried in the first week as they didn’t appear to be drinking, but then the water level started to slowly go down, I did later read that they get most of the water they need form the grass, especially when its freshly grown. However we still provided fresh water on a regular basis and if you watched them for long enough you would see them taking a slurp or two. As they lived relatively close by to the stable they were checked every day at least once, more often than not several times a day. They became quite a draw for any visitors, especially if they had children; many a time I made the mad dash to turn off the electric fence before a small hand reached out to touch the sheep:) Unfortunately I didn’t always remember to turn it back on again which may explain the few times that an escape took place. After about 10 days I decided to expand the fence to cover the entire orchard, splitting it in two to create a second paddock. The intention was to graze them in one half, then the other, to prevent the build up of worms and parasites; in reality this never happened and they ended up with around two acres of grass and orchard to charge around in, more than adequate I thought, but I will plan better next year. In the end though we knew they had to go, it was something that we had planned right from the start and especially as the male was starting to get boisterous; I was worried about my ability to handle him anymore, even with a loaf of dried bread to hand 🙂 I wont go into detail of the slaughter as there is not much to tell, it was over and done with quickly and we split the carcasses so that we could share out the meat with Steve and Dorota. We did our own butchering and have enjoyed several glorious meals to date; a couple of roasts, a curry and a shepards pie; the meat is sweet and tender,although I would like to hang the carcass next time to improve the flavour and make butchering easier. For the record we collected over 50Kg of meat, for £120 plus capital expenditure of say £80; which should be be spread over say five years; £16 per year, so 50Kg for £136 = £2.72 per Kg. The cost to cure two fleeces was around £38 if you include transport costs. The electric fence works well, but can be breached if they really want to, so keep your sheep tame(ish) and they will be less likely to go too far if they break for freedom. You could of course build an expansive fencing system. Make sure that you have separate paddocks to allow the movement of the sheep to prevent worms and parasites; I have further reading to do on the subject but the principle should be followed. Buy some Verm-x, organically certified worming treatment. Buy two ewes from a registered source for future breeding, preferably a recognised rare or traditional breed. Use an abattoir for the slaughter and slaughter later in the year, November onward. Consider keeping one on as a Hogget (12-18 months old) before slaughter. Make sure the carcass is whole and hang for a least 10 days, as long as the slaughter is done later in the year it should be possible to do this at home. And if your interested and want to read more there are some great things on the web as well: The Accidental Smallholder is a top read covering a wide variety of smallholder subjects. Previous Previous post: Knife crime!